Walt Disney Animation Studios’ vibrant world of Zootopia arrives home on June 7 via Digital HD, Blu-ray™ and Disney Movies Anywhere!! Order it today on Blu-ray/DVD Combo Pack or Digital HD! 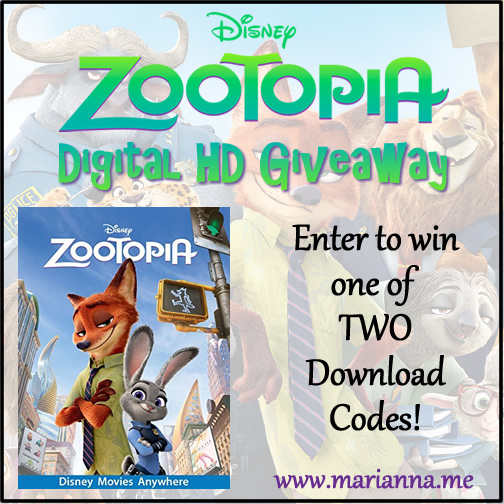 Scroll down for your chance to win one of TWO digital download codes! Walt Disney Animation Studios’ comedy-adventure, Zootopia broke records worldwide, earning more than $900 million at the global box office to date. 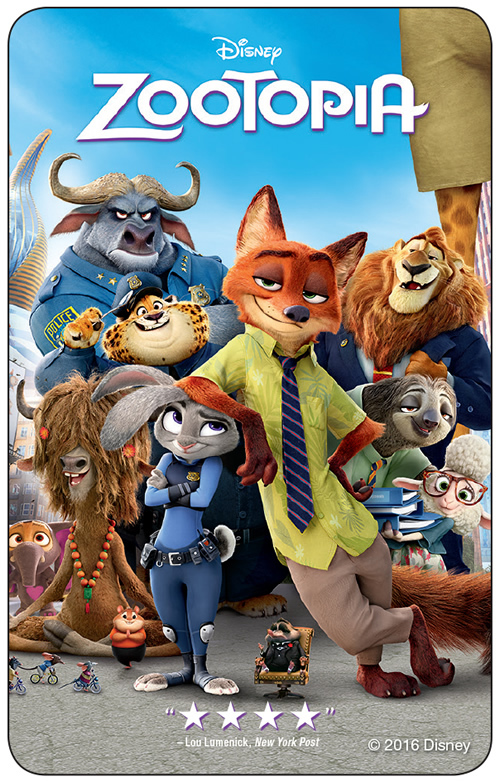 The best reviewed movie of 2016, critics and audiences around the world have fallen in love with the wonderfully innovative animal metropolis of Zootopia and the comedic chemistry of rookie rabbit officer Judy Hopps (Ginnifer Goodwin) and scam-artist fox Nick Wilde (Jason Bateman). It’s been called one of the best buddy cop comedies in years! Thankfully, there’s more—much more. When the animated hit arrives home on Digital HD, Blu-ray™, Disney Movies Anywhere, DVD and On- Demand (does not include bonus) platforms June 7, 2016, viewers will also discover more about the evolution of this extraordinary tale through in-depth bonus features. *Open to US resident only, 18 years or older. 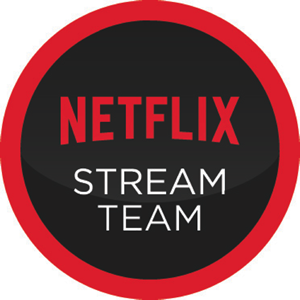 Directed by Byron Howard (“Tangled,” “Bolt”) and Rich Moore (“Wreck-It Ralph,” “The Simpsons”) and produced by Clark Spencer (“Wreck-It-Ralph,” “Lilo & Stitch”), the progressive mammal metropolis of Zootopia is a melting pot where animals from every habitat live side by side and "anyone can be anything." But when new rabbit police officer Judy Hopps (voice of Ginnifer Goodwin) arrives in town she discovers that being the first bunny on a police force of tough, hulking animals isn't so easy. Determined to prove herself, she jumps at the opportunity to crack an unsolved, challenging case even if it means working with a fast-talking, scam-artist fox, Nick Wilde (voice of Jason Bateman), to solve the mystery. But the case leads these two unlikely partners to an uneasy conclusion that Zootopia’s "evolved" society is being pulled apart by unseen forces determined to use fear to take control of the city by turning predators and prey against each other. I've seen the movie and I loved pretty much everything about it. I haven't seen it but would like to watch with my niece. I have not seen it. My grandson has and he loved it. We havent seen it yet because we dont go to theaters, however we are super excited to see it when it comes out! We haven't seen it yet but we really want to! I'm looking forward to a funny family movie we can all watch together. I haven't seen it yet but I really want to!